Science of the Saints, 2-I-2019 (20 Dec.) The Holy Martyr Ignatius the God-bearer. The Hieromartyr Ignatius the God-Bearer, a native of Syria, was a disciple of the holy Apostle and Evangelist John the Theologian, as was also Sainted Polycarp, Bishop of Smyrna. Saint Ignatius was the second bishop of Antioch, and successor to Bishop Evodus, Disciple from amongst the Seventy. Tradition suggests that when Saint Ignatius was a little boy, the Saviour hugged him and said: “If ye wilt not turn and be as little children, ye shalt not enter into the Kingdom of Heaven” (Mt. 18:3). The saint was termed “God-Bearer” since he had the Name of the Saviour in his heart and prayed unceasingly to Him. Saint Ignatius was zealous and spared no efforts for toiling in the fields of Christ. To him is attributed the establishing within church services of antiphonal singing (for two parts or choirs). During time of persecution he was a source of strength to the souls of his flock, and was himself ardent in the wish to suffer for Christ. In the year 106 the emperor Trajan (98-117), on the occasion of a victory over the Scyths, gave orders to everywhere offer sacrifice to the pagan gods, and put to death any Christians refusing to worship idols. And in the year 107, during the time of a campaign against the Armenians and Parthians, the emperor Trajan happened to pass through Antioch. Here they made denunciation to him that Bishop Ignatius openly confessed Christ, and with this taught to contemn riches, to lead a virtuous life and preserve virginity. At this moment Saint Ignatius himself came voluntarily before the emperor, so as to avert persecution against the Christians in Antioch. The persistent requests of the emperor Trajan were resolutely rejected by Saint Ignatius. The emperor then decided to have him taken away for devouring by wild beasts at Rome. Saint Ignatius joyfully accepted the sentence imposed upon him. 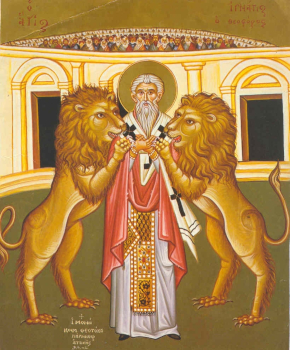 His readiness for the deed of martyrdom was attested to by eye-witnesses, accompanying Saint Ignatius from Antioch to Rome. From Smyrna, Saint Ignatius went to the Troiad. Here he met with the happy news about the cessation of persecution against Christians in Antioch. From the Troiad, Saint Ignatius sailed to Neapolis (in Macedonia) and then to Philippi. Along the way to Rome Saint Ignatius visited churches, and gave discourses of teaching and guidance. He also then wrote six epistles: to the Ephesians, to the Magnesians, to the Trallians, to the Philadelphians, and to the Smyrna Bishop Polycarp. All these epistulary letters were preserved and have survived to our present day. The Roman Christians met Saint Ignatius with great joy and profound sorrow. Certain of them had hopes to persuade the people to give up on making it a bloody spectacle, but Saint Ignatius implored them not to do this. Bending down upon his knees, he prayed together with all the believers for the Church, for love between the brethren and for an end to the persecution against Christians. On the day of a pagan feast, 20 December, they led Saint Ignatius into the circus arena, and he turned to the people: “Men of Rome, ye do know, that I am sentenced to death not because of any wrong-doing, but in love of my One God, by love for Whom I am embraced and unto Whom I do aspire. I am His wheat and by the teeth of wild beasts I shall be grinded, so as for Him to be a pure bread.” Right after this the lions were released. Tradition relates that in going to execution, Saint Ignatius unceasingly repeated the Name of Jesus Christ. When they asked him why he was doing this, Saint Ignatius answered, that he carried this Name in his heart, “He that is imprinted in mine heart, is He Whom I confess with my lips.” When the saint was torn to pieces, it turned out that his heart was not touched. Having cut open the heart, the pagans beheld within it in gold lettering : “Jesus Christ.” On the night after his execution Saint Ignatius appeared to many of the faithful in their sleep to comfort them, and certain of them saw him at prayer. Hearing about the great courage of the saint, Trajan thought well of him and stopped the persecution against the Christians. The relics of Saint Ignatius were transferred to Antioch, and again at a later time on 1 February were returned with glory and put in the church named for the Hieromartyr Clement, Pope of Rome (91-100). Previous Previous post: Science of the Saints, 1-I-2019 (19 Dec.), The Holy Martyr Boniface. Next Next post: Science of the Saints, 3-I-2019 (21 Dec.) The Holy Martyress Juliania of Nicomedia.